The spiral galaxy NGC 1309. A spiral galaxy is a galaxy with a flattened disk and a nuclear bulge from which emanate luminous spiral arms. As well as stars, the disk harbors extensive interstellar clouds of gas and dust. Surrounding the disk is a large galactic halo. 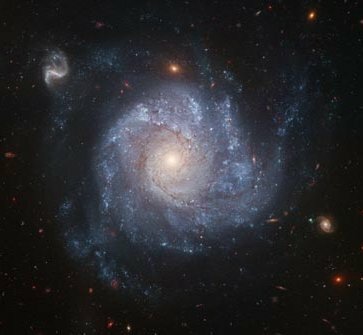 There are two main types of spiral galaxy – barred spirals (type SB) and ordinary spirals (type S), each of which is divided into subtypes a (tightly wound arms, large bulge), b, c, and (sometimes) d (loosely wound arms, small bulge). The trend from a to d is toward decreasing brightness and mass. Spiral galaxies and lenticular galaxies together make up the class known as disk galaxies. In diameter, spirals range from about 10,000 to over 300,000 light-years, and in mass from about one billion to 500 billion solar masses. Spiral structure can apparently exist only in disk galaxies above a certain size and, although spirals represent 80% of the bright galaxies in regions outside of rich clusters (those having many members within a relatively compact region of space), there are no spirals with masses as low as those of many irregular galaxies and dwarf ellipticals. Our own Milky Way Galaxy, together with the nearby Andromeda Galaxy, are both large spiral galaxies. Other relatively close and well known spirals include the Triangulum Galaxy, the Whirlpool Galaxy, the Sunflower Galaxy, the Black Eye Galaxy, the Sombrero Galaxy, M74, M81, and M101. The spiral galaxy NGC 2997 with well-defined spiral arms. A spiral arm is a curved feature, containing young stars, open clusters, HII regions, and dust, that winds outward from the nucleus of a spiral galaxy into the disk. Usually two arms are present that wrap around in a well-defined pattern; however, some spirals have four or, in rare cases, three arms, in an arrangement that may complex and fragmentary. The arms are visible because of bright, massive stars, the formation of which is triggered by the movement through the disk of a density wave. The Tully-Fisher relation is an observed relation between the luminosity of spiral galaxies and their maximum rotation velocity. The Tully-Fisher relation is used as a way of estimating distances to spirals. 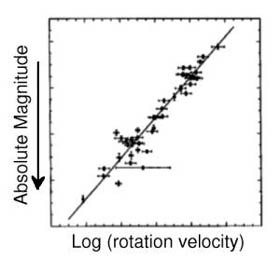 The form is a linear relation between the absolute magnitude of a galaxy and the logarithm of the velocity at the flat part of the rotation curve, although the slopes and intercepts of these relations are different for Sa, Sb, and Sc type galaxies. Approximations made in deriving the relation are that the mass-to-light ratios are constant for all galaxies and that the average surface brightness of all galaxies is also equal.